Our Lisburn Physio clinic, formerly known as The Back Shop, was established in 1992 by Patricia McCarroll BSc (Hons) MCSP, HCPC registered. Enjoying continuous growth as a result of numerous satisfied clients, the clinic is currently staffed by four chartered physiotherapists, each with expertise in varying specialties and fully registered with the Health Professionals Council. 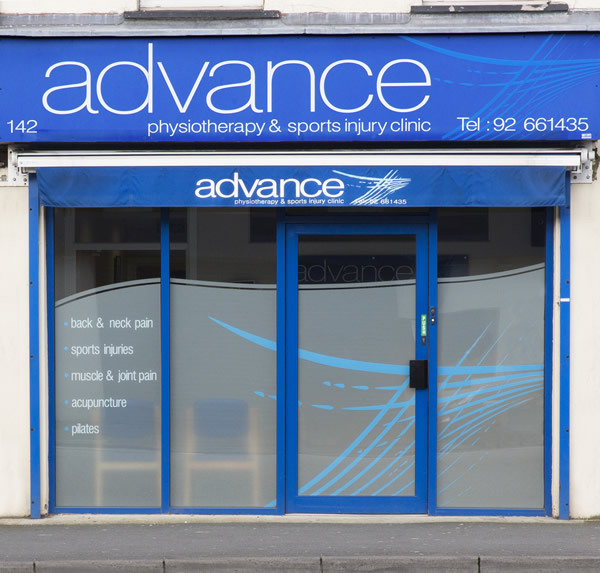 Here at advance we aim to reduce pain and therefore help the body to function normally. We treat people with physical difficulties resulting from illness, injury, disability or ageing. This may be a problem with your joints, discs, muscles, tendons, ligaments or nerves. As specialist physio’s we treat musculoskeletal pain in all parts of the body, such as back and neck pain, sciatica, whiplash and headaches, arthritis, frozen shoulder, tennis elbow and sports injuries. Before you receive treatment one of our experienced Chartered Physiotherapists will discuss your condition, carefully examine the area and provide you with an accurate diagnosis. From this we will agree a treatment programme tailored to your needs that may include soft tissue massage, joint mobilisations, ultrasound, laser, traction, kinesiology taping, and injury specific exercise programme. Jill is the friendly face to answer queries and book appointments.